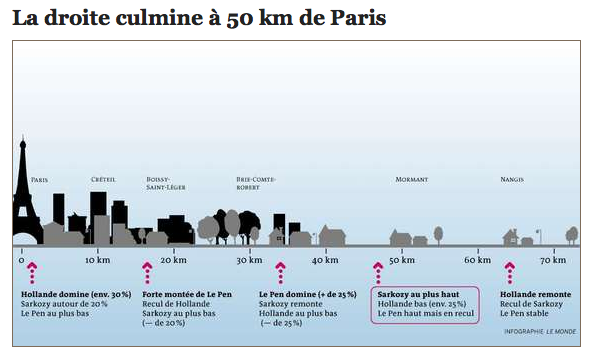 Depuis une dizaine d'années, quelques spécialistes de géographie électorale s'intéressent à ce qu'ils appellent le " gradient d'urbanité ". Derrière cette expression barbare se cache une idée au fond assez simple : selon la distance qui les sépare des grandes aires urbaines, les individus votent de façon très différente. …L'IFOP, dans une étude que Le Monde publie en exclusivité, en fait la démonstration édifiante. Cette enquête se fonde sur les données cumulées de plusieurs sondages d'intentions de vote réalisés entre le 9 janvier et le 14 février. Au total, 8 052 électeurs ont été interrogés. Le principal résultat est le suivant : dans les zones situées à environ 50 km d'une aire urbaine de plus de 200 000 habitants, les trois favoris du premier tour de l'élection présidentielle - François Hollande, Nicolas Sarkozy et Marine Le Pen - obtiendraient quasiment les mêmes scores : autour de 25 % chacun. …Comment expliquer ces chiffres ? La sociologie recoupe la géographie. Au cours des dernières décennies, ces grandes couronnes périurbaines ont connu de profonds bouleversements sociodémographiques. Les agriculteurs n'y sont plus qu'une poignée. Autour des vieux noyaux villageois se sont adjoints des lotissements pavillonnaires et de petits immeubles d'habitat social. Là se sont installées des populations venues des centres-villes ou, plus souvent, des banlieues proches. " Elles sont là par choix autant que par contrainte, explique Jérôme Fourquet, directeur adjoint du département opinion de l'IFOP. Le choix, c'est celui de la verdure, de la mise à distance de la grande ville et de ses nuisances. La contrainte, c'est celle du prix du foncier et de l'immobilier. Pour pouvoir acheter un petit pavillon à la propriété, les ménages modestes doivent aller de plus en plus loin. " The Victory of a Tea Party in China? As part of a deal to end the unrest, China's authorities made the rare concession of allowing fresh elections. The revolt in Wukan came to symbolise anger felt over similar land grabs by officials in rural China. Brice Pedroletti has a full-page article in Le Monde. And selfishly mounted on NON-ELECTRIC VEHICLES at. "…what I did was exactly the same as what Breitbart had done"
Assuming all the details that Matt Taibbi writes about his harassment are true and as terrible as they seem — and we all know from experience to what extent liberals like exaggerating (not least thanks to… Andrew Breitbart), but for the sake of argument, let us assume they are true — and assuming it is correct to lump all "Breitbart fans" together with the few people whose actions are described above (wouldn't Breitbart himself have voiced strong condemnation against such a generalization? ), there are several facts that show very real and very basic differences between the two obits or, rather, simply between the two men. 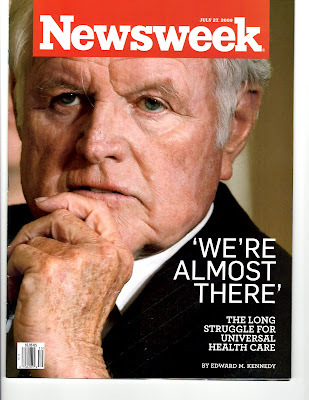 Ted Kennedy was in power, he was part of the power, he was one of the rich and famous, he was royalty. Kennedy was royalty from day 1, from the day of his birth, and a very rich royal at that, both in dollar terms and in what life offered him, on a platter. Kennedy was the government, or part of the government. And he had influence on our lives, fiscal and otherwise, whether we wanted that or not. And he was one of the leftists treated like what the French call L'Homme Providentiel, the providential man, a Savior of the Masses (see also Barack Obama, FDR, Allende, Che Guevara, etc, etc, etc). Yes, things were made extra easy for Ted Kennedy by his being fêted — throughout his life — by one journalist after the other in the mainstream media (unlike, say, either of the Koch brothers), with the other side of the coin being naturally the MSM savaging Ted Kennedy's opponents. And once Kennedy passed a small hurdle, relatively speaking for a member of his clan, to get into the Senate, the mainstream media made it easy for "The Liberal Lion" for the rest of his career (that was only one part of "what life offered him on a platter") — even into death, when one glowering obit after another filled the dailies and the airwaves, the most memorable of which was perhaps the one ending with the thought that had Mary Jo Kopechne known the glorious career of Ted Kennedy, she would doubtlessly have given her life, willingly, for the "Lion of the Senate" to succeed. It is in this perspective, and in this perspective alone, that the language in Andrew Breitbart’s of Ted Kennedy should be understood. Anger with the royalty, coupled with anger towards the myriads of minions in the mainstream media who are not doing their job and who had not been doing so for years, for decades — or who did so/who do so only in the double standard format, one way reserved for Democrats and/or liberals, the other reserved for Republicans and/or conservatives. Lionizing the Democrat while savaging the Republicans. And while the MSM had started speaking of "Kennedy's memory" and of reminiscing, effusively of course, about their idol's life, Andrew Breitbart decided — quite naturally — that a number of unpalatable facts concerning the idol needed to be brought to the surface, and that without delay. As a journalist of the mainstream media famously said (but you wonder today whether he really meant it for everyone, Democrats and Republicans, and at an equal level), you don't kick people when they are down, you kick them when they are up. Andrew Breitbart was willing to kick people — and idols — when they were up. Likewise, in Matt Taibbi's final paragraph, when what he describes grandiosely as Breitbart "hack[ing] into private web sites, tell[ing] lies in an attempt to get his enemies fired, and incit[ing] readers to threats against his targets and their families," he again leaves out one fundamental detail: Matt Taibbi omits to say that what he describes as poor innocent victims (these "private" individuals, "his targets," and "his enemies") are part of the élite — the élite protected by the mainstream media not doing their job but, rather, savaging their opponents. This brings us directly to… Andrew Breitbart himself, or rather to Matt Taibbi's obit for the man. For starters, of course, Breitbart was neither royalty nor fêted by the mainstream media. By contrast with Ted Kennedy, he was never in government, he had no authority, fiscal or other, over people like me, like Matt Taibbi, or like anybody else. Besides, Breitbart never had an easy path in front of him. It is true that Breitbart — eventually — became known, that eventually he also achieved a measure of fame (royalty, in a sense, at least to one segment of the population), but this was only from standing up to the authorities, standing up to the rich and famous, it was from what he did, i.e., it was in the display of courage and that against the well-to-be and the well-connected. As for the élites; as for the mainstream media; and as for all the rubes who believe what the MSM reports, Kennedy was (is) lionized for being royalty, Breitbart was (is) demonized for standing up to royalty. So, to paraphrase from a Danish fairy tale, one obit, Andrew's, was disparaging of the emperor (a rare voice willing to tell unpalatable truths), while the other obit, Matt's (the voice of one of untold followers of the emperor), was disparaging of the simple boy who had dared stand up and describe the emperor's new clothes or, rather, the absence altogether thereof — as were all the hateful comments that appeared from one end of the internet to the other. Hans Christian Andersen ends his tale with the people seeing the truth and breaking into laughter as they mock the emperor; maybe the Danish author should have ended it not with the emperor but with the courageous — yes, the courageous — boy being the object of derision, ridicule, and scorn, along with unreserved hatred for the rest of his life. So what else is new? After all, don’t the vile masses with their dirty chins need more in these days than continuity in every public message and leader to love? Instead, leaders are poised to give speeches about "growth", congratulate themselves for the re-election of Herman Van Rompuy as Council president and sign the 'fiscal compact' treaty. Last week, the 12 leaders sent a letter to EU institutions, calling for bolder economic integration with the USA and deepening trade and investment relations with Russia, China and other strategic partners. Commission President José Manuel Barroso is expected to deliver the message that the EU needs to invest in order to get out of the crisis. Hmm, I wonder where he got that idea?! 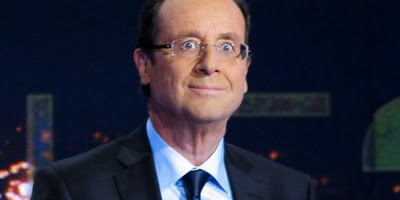 François Hollande is preparing a return to a 75% income tax for the richest people, announces David Revault d'Allonnes in Le Monde, calling it "patriotism for the rich to accept paying an additional tax to help rise the country again." Face aux Français les plus aisés, d'abord : "Je voulais dire qu'il y avait là une façon de faire qui n'est plus acceptable. Un dirigeant ne peut gagner en un an ce qu'un smicard mettra 100 ans à gagner", explique M.Hollande, qui brandit l'argument de l'intérêt général : "C'est un signal qui est envoyé, un message de cohésion sociale (…) C'est du patriotisme d'accepter de payer un impôt supplémentaire pour redresser le pays." Only 43 years old, Andrew Breitbart has passed away, Fox News reports. I saw him at CPAC two weeks ago or so, and he was ebullient as ever… He will be sorely — sorely — missed. The websites he founded ran a statement Thursday morning announcing that Breitbart, 43, died "unexpectedly from natural causes" in Los Angeles shortly after midnight. "We have lost a husband, a father, a son, a brother, a dear friend, a patriot and a happy warrior," the statement said. "Andrew lived boldly, so that we more timid souls would dare to live freely and fully, and fight for the fragile liberty he showed us how to love." … The statement on his sites quoted the concluding passage from his book, Righteous Indignation. "I love my job. I love fighting for what I believe in. I love having fun while doing it. I love reporting stories that the Complex refuses to report. I love fighting back, I love finding allies, and-famously-I enjoy making enemies. Three years ago, I was mostly a behind-the-scenes guy who linked to stuff on a very popular website. I always wondered what it would be like to enter the public realm to fight for what I believe in. I've lost friends, perhaps dozens. But I've gained hundreds, thousands -- who knows? -- of allies. At the end of the day, I can look at myself in the mirror, and I sleep very well at night," Breitbart wrote. The statement ended: "Andrew is at rest, yet the happy warrior lives on, in each of us." Nothing points up the pointless multi-lingual babble-on that is the EU like a Briton talking up ineffectual and market-warping government film subsidies in French. It sounds better in the original Klingon. It must be said though, that the speaker, Debnis Abbot, is an apointed spokesman for the portfolio of multilingualism. 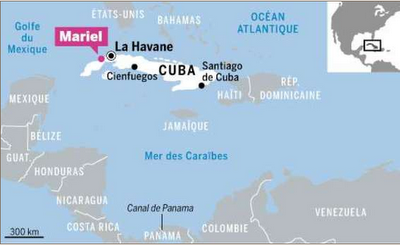 In a Le Monde article by Paulo A. Paranagua on the widening of Mariel harbor — meaning that the Cuban régime is planning for a post-American embargo world — (and as we learn that elder sister Angela Castro has died) we hear the (unsurprising) truth, from the mouth of Raúl Castro himself: "the general" (as he is called by Paulo A. Paranagua — good thing either Castro is not of the right, like Pinochet, or he would be scorned as "the dictator") wants Barack Obama to be reelected. En dépit des gesticulations d'un côté comme de l'autre du détroit de Floride, on travaille à l'après-embargo, quel que soit le futur occupant de la Maison Blanche. Dans ses entretiens avec des visiteurs étrangers, le général Raul Castro ne cache pas sa préférence : la réélection de Barack Obama. writes Phyllis Schlafly, echoing Stephen Baskerville. Despite rigid feminist dogma that there are no gender differences, [the Violence Against Women Act (VAWA)] is totally grounded in feminist-created gender stereotypes. Starting with its title, Violence Against Women, its fundamental assumption is that men are naturally batterers and women are naturally victims. In other words, men are always guilty, and women must always be believed without fear of being punished for perjury. VAWA assumes there is no violence against men, and VAWA doesn't provide services for men who are victims of domestic violence. The feminists have so broadened the definition of domestic violence that it doesn't have to be violent and can be whatever a woman alleges. Definitions of domestic violence include vague and overbroad concepts such as emotional distress, harassment, annoyance, or merely unpleasant speech. … Instead of promoting divorce, breakup of marriage, and hatred of men, VAWA should be revised to encourage counseling when appropriate and voluntary. Some VAWA money should be used for programs to help couples terminate use of illegal drugs and reduce the use of alcohol. … Any man who is accused of domestic violence effectively loses a long list of constitutional rights accorded to ordinary criminals. These include due process, presumption that he is innocent until proven guilty, equal treatment under the law, right to a fair trial, right to confront his accusers, freedom of speech, right to privacy in family matters, custody or visitation with his own children, and even the right to bear arms. The woman is provided with legal representation even though she has not presented any evidence of injury or harm. The man gets no such help. About a fourth of divorces involve an allegation of domestic violence, which in many cases is false or without any evidence. Those allegations usually result in the issuance of restraining orders which the Illinois Bar Association has referred to as "part of the gamesmanship of divorce." … Judges are required to consider allegations of domestic violence in awarding child custody, even though no evidence of abuse is presented. This usually results in the complete severing of child's relationship with his father. VAWA should be completely revised to provide meaningful definitions of domestic violence that are specific enough to identify real victims, to stop the over-criminalization of minor partner discord, to emphasize counseling rather than incarceration, to assure that training programs for prosecutors and judges are objective, to assure accountability by tracking the large flow of taxpayers' money, to respect fathers' rights, to inspect shelters to evaluate success and fairness, and to develop programs to address the common problem of mutual partner abuse. "Mein Führer, we can blame the Republicans… blame the Texan." "the @#%$&$*$@ can't even answer his telephone without a teleprompter!!" With Socialists Like These Who Needs Enemies? Flamby, AKA François Hollande reveals the envy living beneath his pasty Caspar Milquetoast veneer. He proudly announced that he wanted the rich in France to be taxed at a 75% rate, presumably to get his revenge at all of those schoolyard bullies that still keep him up at night. All we can deduce ist’s some kind of Wealth Tax he seems to be thinking of. However you make it, you are taxed for being wealthy, not necessarily earning anything, so it’s especially counterproductive to a nation incurring trade deficits and seeing productive companies take more of their affairs offshore or to eastern Europe. He actually seems to have mixed it up with the other uncreative globally borrowed tirade having to do with executive compensation. I guess all successful people must have been corporate big-wigs, which in France means a subsidy queen and a government insider anyway. "It is not possible to have these levels of compensation," he said. "I learned of the considerable increases in the remuneration of bosses of the CAC 40, two million euros (per year) on average. How can we accept this? " After all, they’re doubling down and calling the political call for heavy taxation “patriotic”. Francois Hollande said anyone earning above the million euro mark should view the surprise measure, which is not in his manifesto, as a type of "patriotism to accept to pay extra tax to get the country back on its feet again". Thanks – I love surprises. Again, for those of you in the cheap seats: crack kills. Thanks, crazy eyes. A French court has just ruled in favor of Charles Enderlin, writes Le Monde's War or Peace blog, by nullifying the 2008 acquittal (for "good faith") of his accuser in the Mohamed Al Dura affair, Philippe Karsenty. Did you notice the "finally" in the headline of the (entirely objective and the strictly neutral) reporter, Gilles Paris? Justice [i.e., a Court] (Finally) Vindicates Charles Enderlin! That's the message one gets from the very first paragraph in Le Monde article by Laurent Zecchini. Parfois l'envie vous prend de lui dire amicalement : " Charles, tu devrais arrêter de penser à tes guerres ; et laisser tomber l'affaire Al-Doura ! " After all, what self-respecting journalist (especially of Enderlin's caliber) would not want to "wash his honor" in the same circumstances as the Mohamed Al Dura affair?! Quant à la récurrente affaire Al-Doura, quel journaliste peut affirmer que, confronté à la même expérience traumatisante, il aurait réagi avec détachement ? Détaché, à coup sûr, Charles Enderlin ne l'est pas, même s'il affirme qu'aujourd'hui, " ce n'est plus une nuisance personnelle ". Follows a long article — by Laurent Zecchini who already a year and a half ago praised Enderlin's integrity while demonizing his "hateful" critics — on adversity, on the vindictiveness of France's Jews, on never-ceasing lawsuits and visits to the tribunal, and on "the solitary quest" to a man to "wipe a spot on his honor as a journalist", a quest by a poor "journalist whose professionalism is not put in doubt" (except that precisely, yes, his professionalism is put into doubt). Des années de reportages et d'analyses vont peu à peu bâtir la réputation d'un journaliste sérieux et pondéré, dont le professionnalisme n'est pas contesté. Here is Laurent Zecchini's article in full which, because it appears in Le Monde's TV section, is behind the daily's firewall. Parfois l'envie vous prend de lui dire amicalement : " Charles, tu devrais arrêter de penser à tes guerres ; et laisser tomber l'affaire Al-Doura ! " 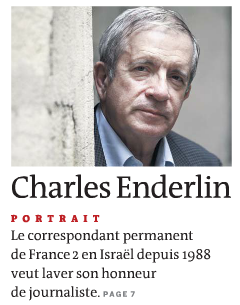 Mais on s'abstient, pour deux raisons : Charles Enderlin, correspondant permanent de France 2 en Israël depuis 1988, est une mémoire encyclopédique du Proche-Orient. L'écouter, c'est entrevoir un éclairage, apprendre une anecdote sur les acteurs du conflit israélo-palestinien, qu'il a illustré de ses innombrables reportages et livres. Et puis, il a un argument imparable : " Un chimiste, il parle de chimie ; un correspondant en Israël, il parle du conflit, avec ses conséquences sur la société israélienne, c'est normal. " Quant à la récurrente affaire Al-Doura, quel journaliste peut affirmer que, confronté à la même expérience traumatisante, il aurait réagi avec détachement ? Détaché, à coup sûr, Charles Enderlin ne l'est pas, même s'il affirme qu'aujourd'hui, " ce n'est plus une nuisance personnelle ". Rappel des faits : les images de la mort du petit Mohammed Al-Doura, âgé de 12 ans, filmées le 30 septembre 2000, au début de la seconde Intifada, au centre de la bande de Gaza, par le cameraman de France 2, Talal Abou Rahmeh, ont fait le tour du monde. La thèse de Charles Enderlin est que l'enfant a été tué par des tirs israéliens. Philippe Karsenty, de l'agence Media Ratings, affirme, lui, qu'il s'agit d'une " simple mise en scène " (pour nuire à l'image d'Israël). Charles Enderlin récuse cette " théorie du complot ", mais les péripéties judiciaires perdurent (la Cour de cassation se prononcera le 28 février), et il estime qu'il n'a pas le choix : il doit réfuter les accusations, afin d'obtenir in fine une réparation morale. Laver son honneur de journaliste, n'est-ce pas, à 66 ans, le seul combat qui vaille ?
" Pendant trois ans, reconnaît-il, cela m'a plombé : les menaces, contre moi, contre ma femme, les problèmes rencontrés par les enfants à l'école. " Aujourd'hui, cela va mieux, quitte à faire preuve d'une sérénité un peu forcée : " Ma réputation professionnelle n'a pas été atteinte, mes livres se vendent, je suis toujours invité à des conférences, la réponse de la profession a été extraordinaire, de même que le soutien de France 2. " Mais il ne se fait pas d'illusions : " Ils vont continuer jusqu'à temps que je prenne ma retraite... "
L'adversité, il connaît, ne serait-ce que par l'histoire de sa famille, qui avait quitté l'Autriche en 1938, au moment de l'Anschluss, et par ses débuts en Israël, où il arrive en 1968, après avoir fait partie du comité de grève de la fac de médecine de Paris. Une expérience dans le kibboutz Dafna, qui lui laisse un sentiment mitigé, et un premier emploi de journaliste, en 1971, à Kol Israel, la radio nationale. Commence ensuite, en 1981, le début de sa collaboration à Antenne 2. Des années de reportages et d'analyses vont peu à peu bâtir la réputation d'un journaliste sérieux et pondéré, dont le professionnalisme n'est pas contesté. Jusqu'à cet échange incertain de tirs israéliens et palestiniens, à Gaza, qui va engendrer une âpre vindicte, instrumentalisée par une partie de la communauté juive française. Pourquoi un tel acharnement ? Bien avant l'" affaire ", dit-il de sa voix rocailleuse, " il y avait déjà une campagne permanente d'intimidation contre moi, comme à l'encontre de tous ceux qui font mine de critiquer Israël ". Charles Enderlin a des amis qui respectent ses choix, même s'ils ne les comprennent pas toujours. Daniel Ben-Simon, député travailliste à la Knesset, ancien journaliste, estime qu'il est difficile de " faire la distinction entre Charles le journaliste et Charles l'homme politique ". L'" homme politique " ? " Oui, dans la mesure où c'est un journaliste impliqué pour la paix et la création d'un Etat palestinien. En ce sens, il n'est pas complètement neutre, parce qu'il veut changer les choses. " Comme d'autres, lui aussi regrette que l'affaire Al-Doura " lui empoisonne la vie, devenant obsessionnelle ". C'est aussi l'avis de l'historien Zeev Sternhell : " Le prix moral et humain qu'il a payé est exorbitant, mais je respecte sa décision d'aller jusqu'au bout. " Et le professeur Sternhell d'ajouter une nuance : " S'il y a eu une erreur dans cette affaire, elle n'était pas préméditée, parce que je ne peux pas imaginer Charles, qui est un journaliste honnête, fabriquer un film. " Qu'en pense un homme qui ne fait pas partie de ses amis ? " 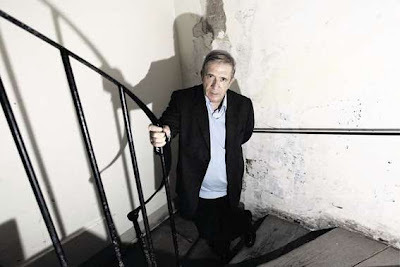 Je considère qu'il a été piégé par son cameraman, nous indique Richard Prasquier, président du Conseil représentatif des institutions juives de France. Par orgueil, il n'a pas voulu l'admettre, et les conséquences ont été extrêmement graves. Et ses confrères ont réagi par solidarité affective, plutôt que par une analyse des faits. " Claude Kandiyoti, autre ami de Charles Enderlin, est l'un des responsables de JCall, cet " Appel à la raison " de juifs européens qui se réclament du camp de la paix. " Quand j'écoute Charles, observe-t-il, je suis convaincu ; quand j'écoute certains Israéliens, le doute s'installe. 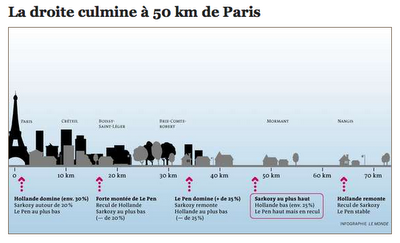 Dans cette histoire, il me semble qu'il y a encore des zones d'ombre. " Tout porte à croire que tant que celles-ci n'auront pas été complètement dissipées, la quête solitaire de Charles Enderlin pour effacer ce qu'il estime être une tâche à son honneur de journaliste ne prendra pas fin. Le Monde gives the list of French artists and films who won Oscars prior to Jean Dujardin and The Artist. 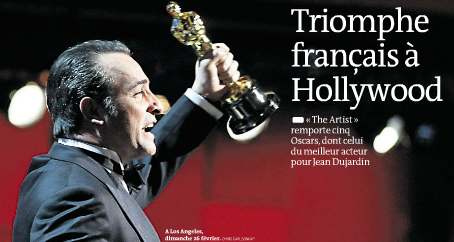 It's the story of a Frenchman who can't be more French than he is nor have a more French name, writes Marion Van Renterghem of Oscar-winner Jean Dujardin in Le Monde. So French in his being and so little French in his acting, the opposite of the intellectual actor. Si français dans son être et si peu français dans son jeu. Le contraire de l'acteur cérébral : intégralement physique, un charisme viril à la Clark Gable, une voix vaguement nasillarde de doubleur de western, un corps qu'on dirait fabriqué pour occuper l'espace et prendre la lumière. Un french lover comme les Américains les aiment, avec le mauvais accent et l'élégance coquine. 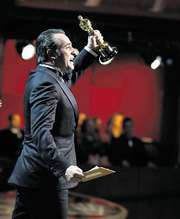 … Jean Dujardin, 40 ans en juin, est un enfant de la télé devenu adulte avec le Web. De cette génération d'acteurs propulsés à la célébrité sans filtre, par un simple "buzz". Ils ne s'empoignent pas sur la politique, ne sont pas hantés par la littérature ni par les films d'auteur comme les cinéphiles de la Nouvelle Vague. "Ils ont en commun une totale décontraction par rapport à l'érudition, au statut des uns et des autres, constate le producteur Alain Attal. Ils n'ont pas honte de citer des comédies "lourdotes" américaines. Chacun participe à tout sur un film, sans frontières entre les métiers." First, it is a medical secret. Then a state secret. After a certain time has passed, it becomes an open secret. While the French are criticizing Americans for being close-minded and not "lucid" and self-critical enough towards their society and towards the people and the institutions who govern them, Isabelle Talès writes a Le Monde review about a documentary showing how France's presidents have often misled their peoples about the true nature of their health, something that becomes known only many years later. La maladie du pouvoir reconstituait ainsi, mercredi 22 février sur France 3, les heures dramatiques où le pays fut gouverné par de grands malades. Enfin... dramatiques, c'est facile de le dire aujourd'hui, mais à l'époque, qui s'en doutait ? C'est comme si l'histoire se rembobinait : on reconnaît les images d'archives (Georges Pompidou de plus en plus bouffi, François Mitterrand de plus en plus fragile), mais elles s'accompagnent désormais du bon commentaire. Lors d'une visite en URSS quelques semaines avant sa mort en 1974, Pompidou, atteint d'un cancer du sang, sourit aux officiels mais souffre d'hémorragies. … L'enquête de Philippe Kohly et Françoise Fressoz (journaliste au Monde) tente de répondre à trois questions : comment ont-ils tenu ? Pourquoi ? Mais surtout, auraient-ils dû tenir ? … On est presque surpris de voir s'ouvrir le dossier Jacques Chirac. Mais peut-être n'a-t-il jamais vraiment récupéré d'un arrêt vasculaire cérébral survenu en 2005. Les témoins ne sont pas encore tout à fait "mûrs" ni tout à fait sûrs. Il faudra encore attendre quelques années. C'est alors que se présente le cas Sarkozy. On l'avait presque oublié : l'actuel chef de l'Etat a été pris d'un malaise vagal en joggant sous le soleil en 2009. Mais là, il est vraiment trop tôt. N'empêche, on sort de ces visites répétées au Val-de-Grâce un peu inquiet. Les candidats qui courent la France ces jours-ci feraient bien de subir un check-up. Et surtout, si ça ne va pas, qu'ils nous le disent ! Forty years after "Richard Nixon touched down to be greeted by the Chinese premier, Zhou Enlai, at the airport in what Westerners in those days still called Peking", the New York Times' John F Burns reminisces wistfully, even eagerly, on how China's communists "taught" the Americans a lesson, with those wise old men even showing restraint in the exercise thereof. If the board had been bigger, the inscription might have added these still blunter words from the same passage: “When we say ‘imperialism is ferocious,’ we mean that its nature will never change, that the imperialists will never lay down their butcher knives, that they will never become Buddhas, till their doom.” But the Chinese, ever economical in their dealings with foreigners, must have felt that they had made their point with sufficient clarity. Now ain't that something? Not only did China's communists teach America's capitalists that the latter aren't better than anybody else, according to the New York Times, those wise leaders even exercised restraint in doing so! Almos' makes you wanna forget the tens of millions o' Chinese citizens killed by Mao and his henchmen, don't it? !